Many thought that Gambit was the worst caper comedy to be released in years. But little did they know that The Love Punch was right around the corner. 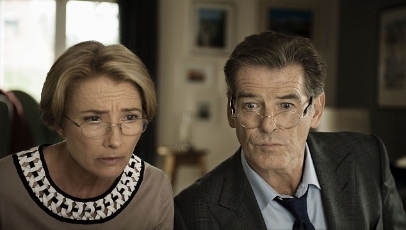 With writer and director Joel Hopkins at the helm, whose Last Chance Harvey was a modest treat, this uninspired and woefully unfunny rom-com centres on Kate (Emma Thompson) and Richard (Pierce Brosnan), a divorced couple who decide to steal a costly diamond when a shady businessman strips them of their pensions. Cue a variation of mayhem that’s funny only to screenwriter Hopkins and almost redundant on narrative. Aside from one or two slimly humorous instances (most of which stem from Timothy Spall and Celia Imrie as Kate and Richard’s constantly bitching long-time friends), there’s absolutely nothing here that hasn’t been done a million times better elsewhere. It’s farcical, sure, but cheaply so and at the cost of almost everyone involved. And, for all the pizazz and wit that Thompson and Pierce possess as actors (to think of them as a mismatched on-off couple is admittedly amusing in itself), even they don’t have enough in them to make up for their shockingly one dimensional and cringeworthy characters. The Love Punch is scenic (when doesn’t Paris and the French Riviera look beguiling?) drivel, but drivel nonetheless. That’s disappointing. I do like Thompson and Brosnan as actors, and I love a good comedy-crime movie. Sad to hear that it appears to have failed so badly. It is a shame. But there’s no sugar-coating it.